Kate Middleton wore a beautiful pink dress at her sister’s wedding that makes us want to transform our wardrobes to all blush. But it’s not the first time we’ve been enamored with one of Kate’s outfits. In fact, we’re often looking to her for fashion inspiration. Like that time she wore a pair of $230 dollar rain boots that we, ahem, had to have. From there, we lusted after her $65 dollar tennis shoes, and her everyday laid-back fashion sense. We even wanted to be in her water balloon fight at Buckingham Palace! Everything about Kate is fit to perfection, and this dress is no different. Duchess Kate looked pretty in pink. 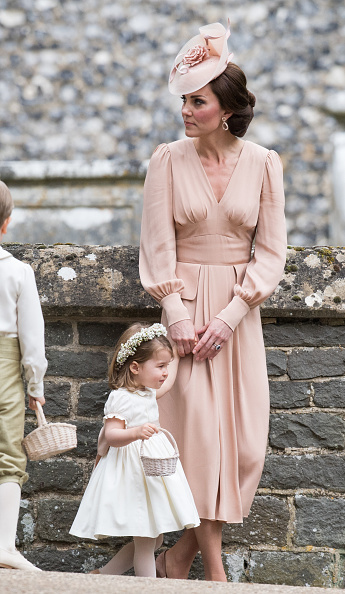 Princess Charlotte of Cambridge attended the wedding with her mother and looked adorable, too. And while we love the pictures of Prince George and Princess Charlotte, their mother’s blush-pink confection had us in awe. It was a simple pink dress but the color on Kate looked incredible, especially paired with her matching hat. Each picture makes the wedding look more and more beautiful. And Kate and Pippa looked happy as ever as Pippa stepped out with new husband James Matthews. It was a wedding out of a fairy tale, much like Kate’s wedding to Prince William. 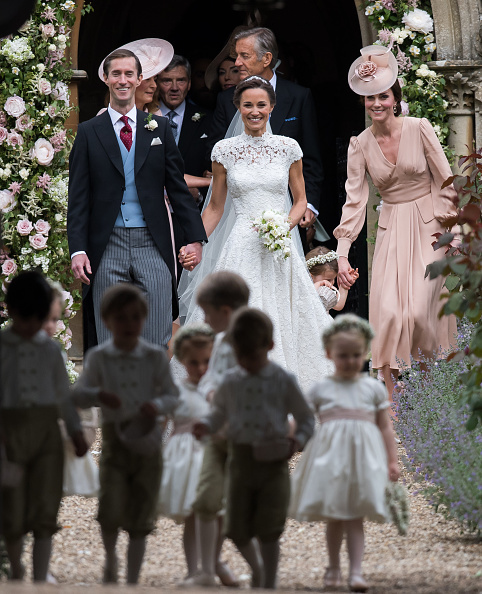 With the flowers in the children’s hair and Pippa and Kate’s beautiful dresses, everything seemed perfect. Our love for the royal family continues on, and our envy for Duchess Kate’s wardrobe is only stronger now. Pippa, meanwhile, looked ever so the beautiful bride. It truly was a day for the ages, and now we have these amazing pictures to look at for years to come!